Black Moon was founded in 2010 by Jo Black and a business partner, then called Black Inc. They opened the shop in the November of that year in King Street. During the four years in the King Street shop, Jo has apprenticed Chris Coleman, now at Imperial Tattoo in Bath and Merry Morgan who has also moved on to Imperial Tattoo in Bath. 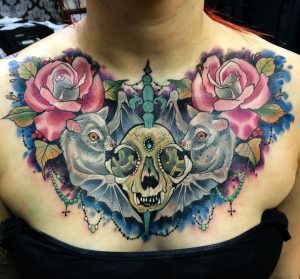 In October 2015, Black Moon expanded to Stony Street and brought in Verity Fox and Yoji Canniffe from Silver Street Tattoo in Bradford on Avon. Since then the shop has gone from strength to strength and is very lucky to have now expanded once again to a two floored property in Cheap Street. Upon opening the new shop Jo and the team on Jodie Young as a full time apprentice. Within the new expansion there will be merchandise from various brands, and new cosmetic ventures such as laser removal, eyelash extensions, piercing and much more! Black Moon Tattoo are very proud of their custom work. Pop in talk to them about your idea and they will do their best to create something extra special for you that’s completely original. The creative, friendly and experienced team will make getting a tattoo a great experience, and you’ll come away with a beautiful and permanent momento.